Torquoise Lakes, Vertical Landscapes – Schmocken! Our last night in the Hotel Alpenrose was marked by a solid sleep and a late’ish waking hour – around 8.15am (late by holiday standards when touring). We didn’t hurry to get ready for the trip to Interlaken or to get down to breakfast. In fact, it was close to 9.30am by the time we exited the room and made our way downstairs to the dining room. We were the only diners this morning (at least at the hour we arrived) and it was nice to have the dining room to ourselves. The excellent service that we had become accustom to continued this morning and we enjoyed taking our time to enjoy the sumptuous food and the newly decorated windows. Anna Marie, her mother and her aunties had been busy over the past 24 hours and the new decorations provided a lovely foreground to the mountain views outside. We packed most of our belongings before we went down to breakfast so, on returning to the room, we finalised the last packing and headed down to the lobby to check out. We really enjoyed our stay at Hotel Alpenrose and we valued the family hospitality and the wonderful accommodation and dining. This meant that our check out took longer than it would have in a larger chain hotel because we were not in a hurry to leave. There is something to be said for staying in the smaller hotels! We departed the hotel around 10.45 and drove down to the local petrol station on the outskirts of town to fill the car up – petrol seemed to be a little cheaper in Austria (being on the Euro currency) than in Switzerland (Swiss Francs) so it was worth heading over the border with the tank full. 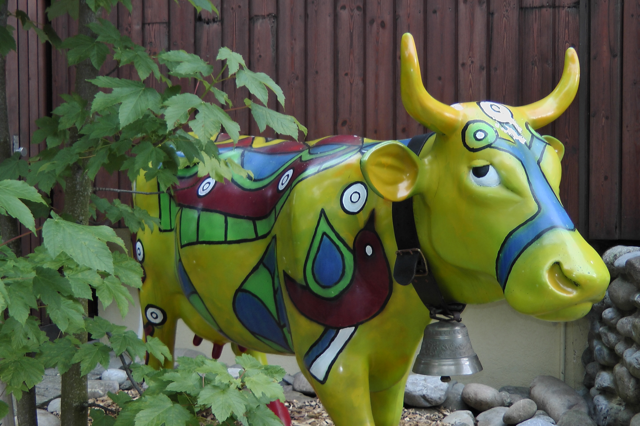 The drive to the Swiss border was the reverse of last night’s return trip from St Gallen – a now familiar drive through the beautiful mountains, past the lush paddocks and resting cows and through long tunnels. One could never tire of this drive. Today it was made even more spectacular because the cloud base had lifted and the sun was proudly warming the Austrian landscape once more. Our friendly surfer dude GPS did a great job of getting us on and off motorways and through the border crossing and into Switzerland. Around 12.30 we were well into Switzerland and soaking up the sheer beauty of this delightful country. We drove down the distinct border of Lichtenstein then past the beautiful shoreline of Walensee – our first view of one of Switzerland’s many stunning lakes. The almost turquoise water back dropped by towering mountains and the red pitched roofs of Swiss farm houses was amazing. A feast for our eyes. It doesn’t matter how many times one sees this sort of scenery, you can never stop appreciating the sheer beauty of it. More “wow” moments. 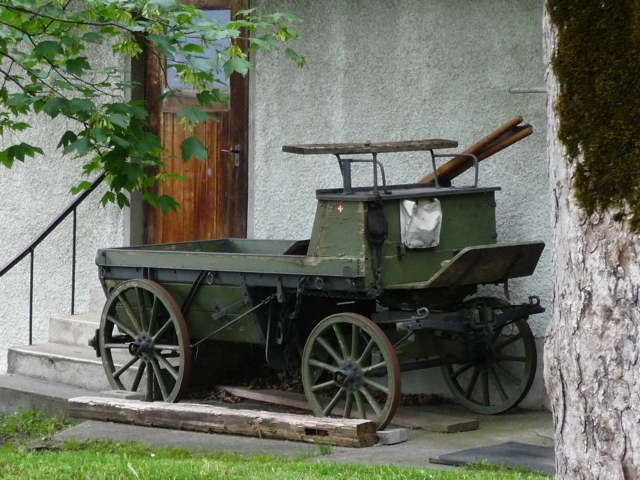 To make travel through Switzerland a little more driver friendly the Swiss have also perfected the art of burrowing into and through mountains. It would be a difficult and slow drive if it were not for the impressive tunnels that make mountain driving a thing of the past in this part of the world. After passing we came out into what could be described as (relatively speaking) flat land. It didn’t last too long but the contrast of the low hills and “distant” mountains meant that our senses noticed this short pause in vertical landscape scenes. We returned to the waterfront driving along Obersee albeit that we didn’t see too much of it because of the number of tunnels we drove through. This part of the drive took us south of Zurich and west/southwest toward Luzern. Negotiating the transit of Luzern was made easy with the aid of our talking GPS and before long we were back into the tunnels and heading further west toward Interlaken. Our next clear view of another stunning lake was during the slow drive past Lugerersee. Slow because of the speed limits and slow because it was hard to drive past this stunning lake at anything other than a “respectful” speed. As we climbed up the mountain pass west of Lugern (one of the larger towns bordering the Lugerersee) we stopped at a roadside lookout and stood in awe of the sight that lay before us – a beautiful turquoise lake located between two towering mountain ranges with historic Swiss villages surrounding the lake. Just beautiful. After snapping a few “postcard” shots of Lugerersee we continued our trip up the winding mountain pass. However, it wasn’t long before we stopped again. The Princess needed a “pit stop” and we were both ready for lunch. 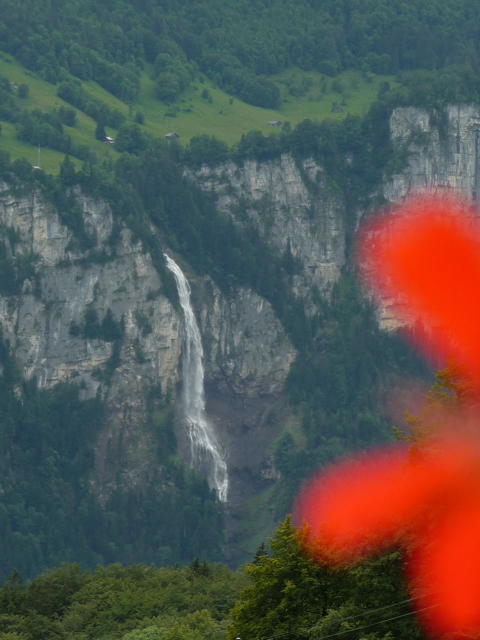 A wonderful opportunity presented when we passed a cliff top restaurant called Brunig-Kulm. It was perched on the edge the road overlooking the valley below. We opted to dine outside on the restaurant’s balcony. The stunning afternoon sun kept us warm although the view distracted us from eating the tasty broccoli soup and salami and cheese sandwich that we ordered. We were also distracted at times by the low flying Swiss Air Force turboprop trainers and fast jets flying over head. We didn’t realise that there was an air force base located deep in the valley below us. After lunch we headed down the mountain side road and down into the valley where the air force base was located. Flugplatz Meiringen (as it is officially known) must be one of the most scenic airfields I have every seen. The valley it is located in is stunning and on one side of the valley is a sheer cliff with a huge waterfall running down the side of it. Part of the runway has a road crossing it so when the jets are ready to take off they simply close the road (like a train crossing) and let the jets take off. Not a lot of visible security in these parts. Maybe something to do with the neutrality of the country. 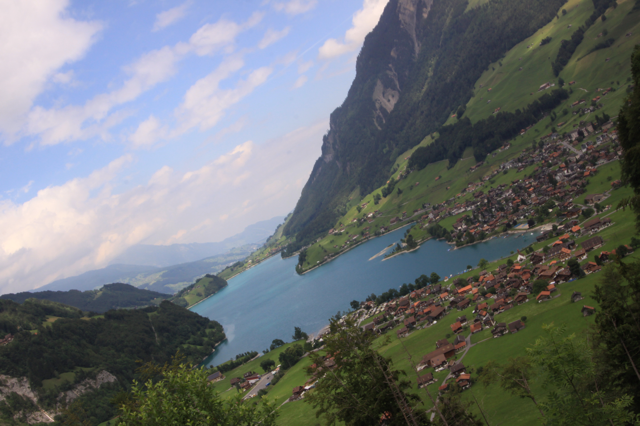 We continued our drive west along the Brienzersee (one of two lakes that sit either side of Interlaken) and made good time as we neared Interlaken township. We are staying in an area called Beatenberg (just north west of Interlaken) in a town called Schmocken. Beatenberg is a beautiful area perched on a steep mountainside that overlooks the western lake of Thuner See. The drive up to Beatenberg reminded us of the roads surrounded Lake Como albeit that there were not many crazy Italian drivers on these roads! Our ascent into the Beatenberg area was complimented by dozens of paragliders that were soaring the ridge lines of the high mountains in these parts. This area is famous for its outdoor activities and its views. Combining paragliding with these views makes a whole lot of sense! We arrived at Hotel Gloria around 4.30pm – a little less travel time than we envisaged. The helpful staff had us checked in to our room with a view in no time. Before The Princess entered the room I asked her to close her eyes then lead her out onto the balcony. On opening her eyes her jaw dropped and she stood in awe of the incredible sight. A bird’s eye view of Thunersee, across the turquoise colored lake and south to “the top of Europe” as it is known – the Swiss Alps. Needless to say, we didn’t leave the balcony in a hurry. We settled into our chalet style loft room quite quickly and then donned some warm clothes before taking a short stroll through the small town of Schmocken. Despite some light showers we enjoyed the slow walk in the cool mountain air. We walked down to the Niederhorn cable car terminus and viewed the comings and goings of the cable car before returning to the hotel. We met some of the “locals” (noisy goats) on the way back to the hotel and enjoyed listening to their very loud “baa’ing” and the sound of their small bells. When we entered the hotel after our walk we were greeted by the friendly hotel staff. They were preparing the dining room for tonight’s dinner. We ordered a drink and sat out on the balcony (despite the cool evening air) and spent time getting to know the staff. One of the owners of the hotel (Berhard) came out and introduced himself to us as we were enjoying a “sundowner” and the view of the Swiss Alps. Bernhard (a Swiss national) had spent 20 years in Australia and he and his wife Jacky (an Australian from Adelaide) came back to Switzerland and bought Hotel Gloria 4 years ago. It was great to talk with Bernhard. 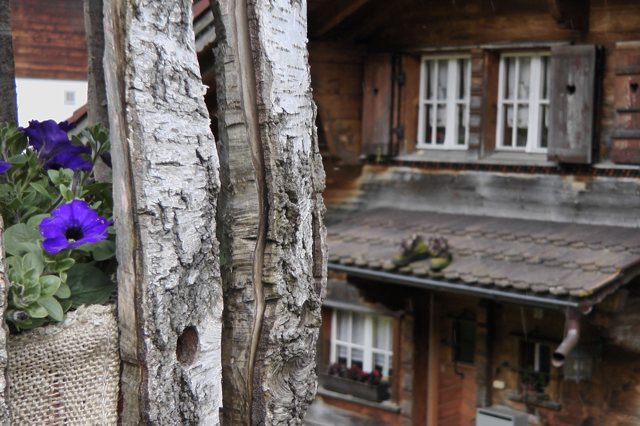 He gave us some wonderful tips on touring the local area and a short history of Switzerland – fascinating stuff that we will share with you over the coming days. Jacky also introduced herself to us during our time on the balcony and we look forward to catching up with Bernhard and Jacky more during our time here in Beatenberg. We finished off another wonderful day with a delightful meal in the hotel restaurant. We shared a very tasty pumpkin soup before experiencing (that is what is was) the most magnificent American seared scallops and some chicken and avocado salad. I washed my meal down with some smooth Italian red. The Princess’ alcohol intake is reduced to zero at the moment due to the antibiotic – probably not a bad thing. Maybe I should go out in support. We will see how the weather shapes up when we wake in the morning before we make any solid plans. One thing is for sure – we will make the most of the day despite the weather and we will have another day of incredible experiences. Fact! The bells from the Piazza Roma church woke us from a very deep sleep again this morning. Our rather tired bodies were reluctant to leave the comfort of the bed (the Multipulciano red last night perhaps) however, we are not on holidays to sleep so we told our muscles to get moving in the direction of the shower. We also had to move rooms today so we wanted to get up and sort out some basic packing before we went down for breakfast. The room we were in was not available for the 4 nights when we booked online (reminder to book a little earlier once we are sure of the hotel we want to stay at!) and today was the move day. Breakfast in the very quaint dining room was perfect. We opted not to eat supper last night (only our tasty cheese and salami rolls with the red wine we purchased at Carrefour) so our stomachs were rather relieved to have some sustenance for the morning. The staff at the Miralago are wonderful and breakfast is more of an experience than just a reason to eat something. It is nice to go down and say hello to them all in the morning. Fortunately, the new room was ready soon after we finished breakfast so we finished our packing and moved downstairs to the larger corner room on the first floor – three balconies in this one! Maybe we need to stay longer! After the move was over we headed out of the hotel for a day in the mountains – Monte Generoso in Switzerland to be precise. We saw a brochure for Generoso when we arrived in the hotel and it looked perfect for a day of visiting the pre-Alps region just over the Italian-Swiss border. 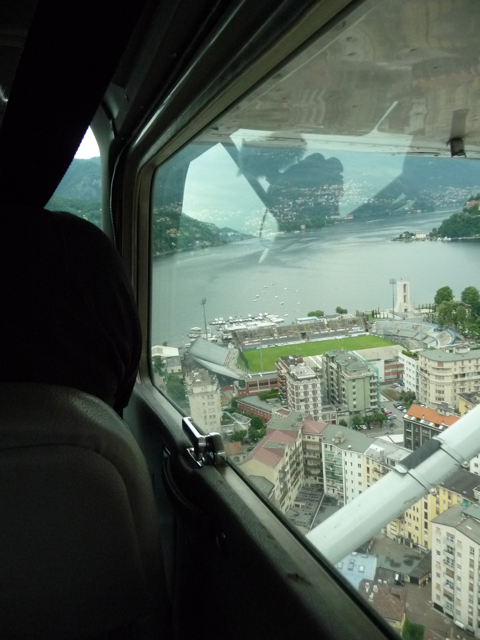 However, before we went in search of some adventure at higher altitude, we wanted to find a restaurant in Como. Cafe Fietta is owned by the mother of one of the girls we met on the first day we arrived in Cernobbio (Sissi). We were keen to support Sissi’s mum by taking in some morning coffee and a croissant however, despite circumnavigating Como to find the “bar”, it was closed! What a pity. “There is always next time”. With no other reason to stop in Como we re-programmed the GPS and asked “surfer dude” to take us to Capolago – the small village in Switzerland where we had to take the mountain train up to Monte Generoso. The trip across the border was via the same route that we took yesterday so we made good time. Fortunately, we were going against the traffic because there was a lot of it going in the opposite direction. We learned late yesterday that today was a public holiday in Switzerland and this meant that there were quite a few cars on the road. We arrived at the quaint railway station in Capolago just in time to see the small mountain train depart up the track. On purchasing our tickets we were told that it was another hour before the next train departed. A perfect opportunity to get the first coffee in post breakfast! We walked across the street to the nearest coffee house and pulled up a table in the courtyard. With our best Italian (read close to nil) we ordered a tea and a coffee and settled in for 45 minutes. Actually, the waiting time gave us the chance to clean our camera gear and prepare ourselves for the trip up the mountain. We boarded the 1135 train a few minutes before it departed and settled into a window seat. The train left spot on time (must be wearing Swiss watches!) and headed effortlessly up the “cog wheel” track. The first train to run up the mountain ran around 1867 and was built to support a restaurant that Dr Carlo Posta set up on the mountain. You have to hand it to a man with vision! The trip up to the 1700m summit took 40 minutes – a leisurely pace that allowed us to view some of the spectacular scenery en route. Indeed, we were able to stand up comfortably and video and photograph without any problems. We disembarked alongside Ristorante Vetta (the terminus near the summit) and decided to have some lunch before we started trekking around the hiking trails near the station. We shared a very tasty pasta dish and washed it down with some white wine – seemed like the appropriate thing to do whist sitting on a verandah overlooking Lake Lugano some 4000′ below us! What a spectacular lunch venue! The weather cleared a little as we were eating so we went walking in the direction of one of the lookouts near the station. The views were absolutely beautiful despite the haze and the overcast conditions. In some respects, it was nice to have a cold afternoon to move around the mountain top. We took some time out just to sit in the lush grass and amongst the spring wildflowers and take in the atmosphere on top of Monte Generoso. Cow bells (on a local herd of dairy cows) were ringing in the background and the variety of accents from fellow tourists made the whole scene feel very surreal. In fact, I broke into “the hills are alive with the sound of music” on more than one occasion while we were up the hill. 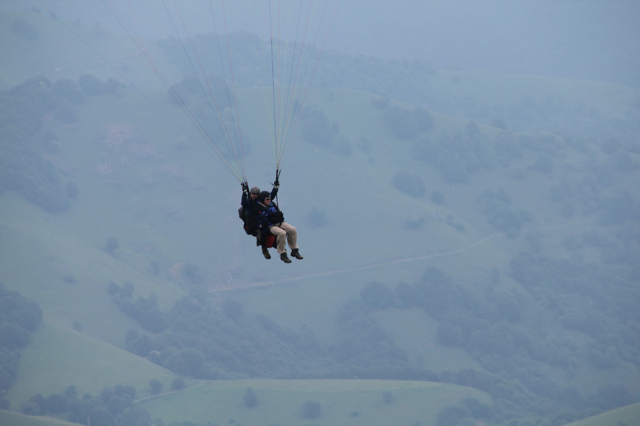 Despite the temperature being on the low side and the clouds doing their best to hide the sun, the conditions seemed to be suitable for paragliding – so much so that a dozen or more enthusiasts launched themselves of the mountain and into the afternoon air. Watching the launch activity and viewing the colored shutes contrasting against the very green background was an easy way to pass some time! I offered to fund a ride for The Princess however she wasn’t too keen to throw herself off a very steep mountainside and into the Swiss air! Mind you, I wouldn’t have done it either. We continued exploring the mountain top with a walk past the nearest farm house (very near) and through the herd of cows and goats that were grazing the slopes of Monte Generoso. The goats were actually heading back to the barn and were most interested in The Princess’ camera bag. They probably thought she had some food. The farmer’s familiar call convinced the goats that we were not the “hand that fed them” so the herd headed off to have their very full udders emptied in the quaint barn. Despite the cows being most interested in the lush mountain grasses one of them paid particular attention to me as we walked by. I am not sure if she was just wanting to introduce herself or whether she was telling me to get off her “patch”. Either way, I wasn’t too keen to find out the answer and retreated to a slightly higher level on the steep slope. She left me alone and went on turning grass into milk. 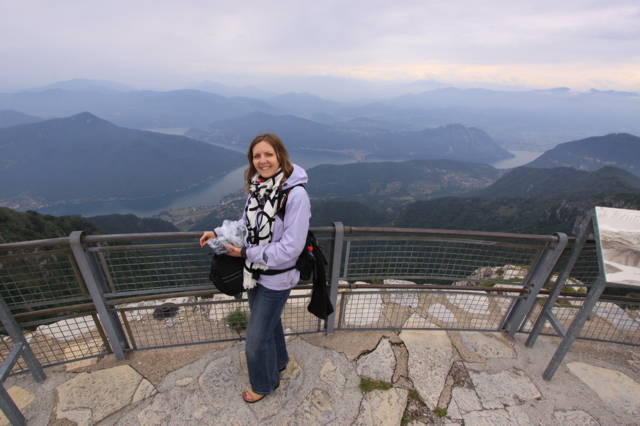 The true summit of Monte Generoso is slightly higher than the area where the train terminates and we were keen to view the surrounding region from the very top. We negotiated the narrow track up the “back side” of the mountain just as clouds started forming across the ridge line. The site of warm air being condensed into cloud as it was pushed up the western side of the mountain was a sight that, meteorologically speaking, was worth experiencing. Even The Princess was impressed with Mother Nature’s display of cloud forming. 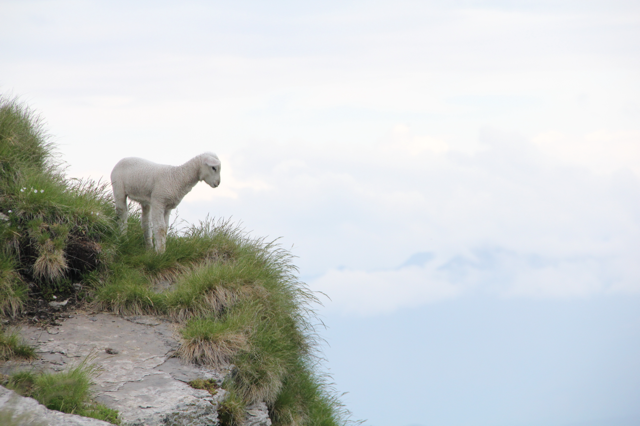 Just prior to reaching the summit we passed some newborn lambs and we enjoyed watching them bouncing around their mothers as they tried to gain strength in their spindly little legs. Another treat for us courtesy of Mother Nature! The true summit offered views north to the Italian Alps all the way around to the most southern point of the Swiss Alps – wow! 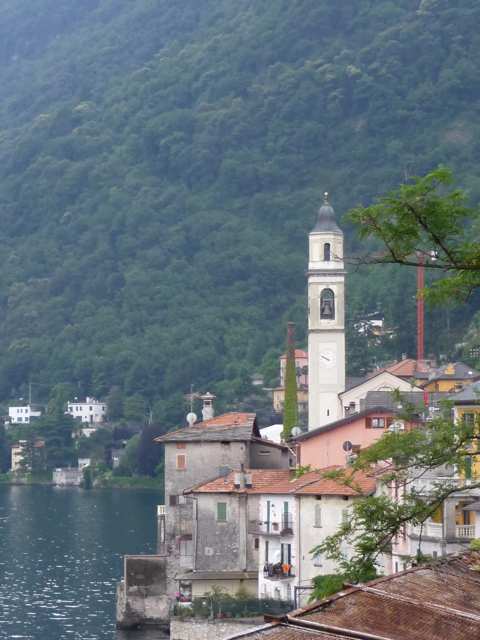 The foreground lakes – Como, Lugano and Maggiore split the pre-Alps into spectacular valleys and the ancient man made towns, train and road systems made the whole thing feel like a scene from a “miniature world” display. We felt like two birds looking down from a roosting nest and observing the land below. With the cloud enveloping the mountain and the temperature dropping we made our way back down to the station. I warmed up my insides with a coffee before cooling them down again with a tasty ice cream that we both shared. What were we thinking? Ice cream on a cool mountain top in the pre-Alps of Switzerland. Our brains must have frozen during the time on the summit. The trip back down on the electrified cog wheeled train took us through the cloud and into the warmer air. The return journey took exactly 40 minutes (not sure how that works given the pace of the descent) and we disembarked the train around 5.30 back at Capologo. If this is a precursor to what is in store for us when we head into Austria and Switzerland next week then “bring it on”. What a magic way to spend our last day of visiting the Lake Como area. As we sit on one of the three balconies that overlooks the Piazza and Lake Como, we are reminiscing about the wonderful 4 day visit to this beautiful area. We are enjoying a pre-dinner treat (more salami and cheese) with the last of the Italian red before freshening up and heading out to eat. The sights and sounds of the foot traffic below us are very interesting – they must have shopped at some of the technicolor garment shops that we saw yesterday. Maybe there is a fancy dress party in the local area? Or, maybe, I just don’t have any culture and need to “get with the program” of wearing clothes that cover the spectrum of the rainbow and spray enough perfume on my body to keep a French perfumery in business for a year. I suspect that the latter reason is the case however, as I down another spectacular Italian wine tonight I wont be putting a lot of mental energy into the state of Roey’s fashion sense. We are using our iPad for our alarm and the chime is set to “church bells”. Well, this morning we woke to the constant sound of church bells ringing and thought it would reset to a sleep mode. However, the bells kept ringing. Eventually I opened the iPad to turn off the alarm only to find that it wasn’t chiming at all. The culprit was the chapel’s bells in the street next to our hotel. We learned later that they were sounding “market day” here in Cernobbio. A beautiful way to wake to another day here in Italy! Unfortunately, for those selling their wares at the market, today is rather inclement and we gather that this will keep the crowds down. The Princess and I are up for the challenge though so we are about to don our rain jackets and borrow the hotel “brollies” and go in search of some local produce. When in Rome ( or in this case Cernobbio) do as the Romans would do – attend the local markets. Happy to report that we ended up about as wet as the ducks that call Lake Como home. All the hotel umbrellas were gone when we went downstairs so we braved the heavy downpour with our rain jackets. Our top part stayed dry but our feet and pants were not so lucky. However, it was nice to support the local farmers and to see some of their wonderful produce. The rain seemed like it was going to set in for the day so we decided to bring Plan B into action (we didn’t actually have a Plan A) and spend some time indoors at the Fox Town outlet stores just over the border in Switzerland. We packed our passports and brushed off the wallet and headed back out into the rain. I left The Princess in the hotel whilst I found the chivalry in me and walked to the parking spot and picked up the car. 1 x happy Princess! I typed the Fox Town address into the GPS and pushed “drive to” and before long we were on our way to Switzerland – our first visit to this country. The short drive took about 20 minutes and we didn’t get asked for our passports as we crossed the border. We arrived in Fox Town just after it opened and spent a couple of hours wandering around the cavernous interior of this “high end” outlet store on steroids. The Princess did purchase a beautiful top in one of the stores but we both agreed that whilst the colors were quite spectacular neither of us were taken by the “Euro” look. However, we did have a lot of fun picking out some outfits and shoes that we would be proud to wear to an swinging 60′s party! The weather had lifted quite a bit by the time we exited the mall so we decided to head back toward Como and find a place to have lunch. As we approached the now familiar western shoreline of Lake Como we remembered a place that we walked past on the day we arrived. It is called N’Joy and is located right on the waterfront near Como. It seemed like we were the only people that were eating at this time of the day so we selected a waterfront table for two and settled in for a delightful mid afternoon meal. We shared a sumptuous saffron cream sauce gnocchi and some excellent bruschetta and complimented it with another delightfully refreshing white Italian wine. We both agree that this is a lifestyle we could very easily become accustomed to. 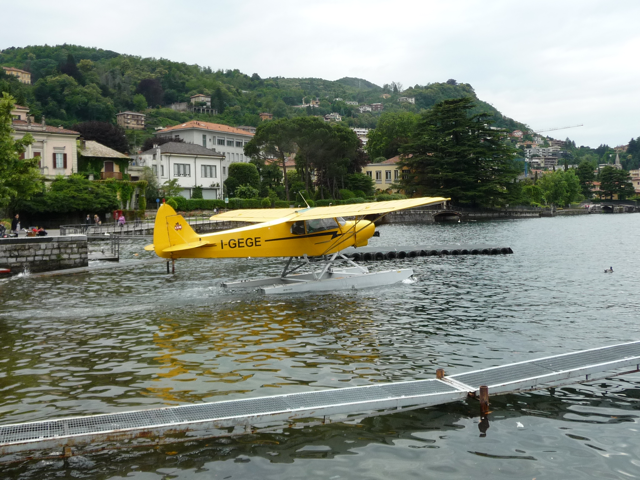 On leaving the restaurant we learned how to ask for the bill in Italian (but have now forgotten) and set off in the direction of the Como seaplane base. While sitting at lunch I decided that the weather was perfect for taking a flight in a seaplane. Cool temperatures, light winds, smooth water and not many people meant that today was the day to go flying. Our trusty “surfer dude” GPS guy negotiated the tight backstreets perfectly and before long we were talking to the friendly aero club staff about taking a flight. As predicted, there was no line up so we confirmed a “slot time” and returned to the hotel to pick up the video camera. We didn’t have to wait too long for the plane to arrive back at the dock from the previous flight. Pietro, our pilot, introduced himself and escorted us to the Cessna 172 floating at the dock and “saddled” us up for our first seaplane ride. 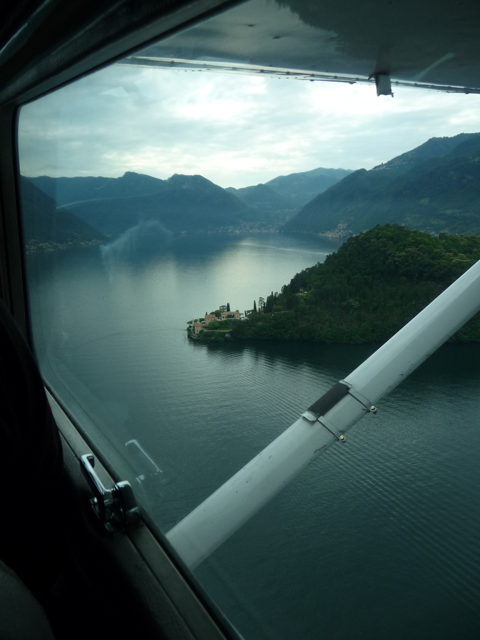 Pietro, an experienced seaplane pilot, fired up the engine and taxied out to the takeoff area just off the shores of Como. He made sure the other planes were clear of the departure path, made his ATC call (in Italian) then opened up the throttle. It took a while for the little plane to “get up on the step” but when it did the ride became very smooth. We lifted clear of the water and into the afternoon sky and started a smooth climb over the lake and north toward Bellagio. 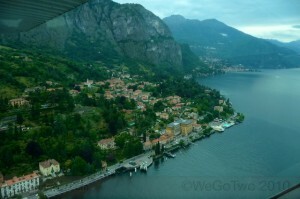 Seeing the lake and the lakeside villages from the air was beautiful. Having a bird’s eye view of some of the incredible villas and stunning mountains gave us a new appreciation of just how spectacular this place is. I took a lot of video while The Princess snapped away from the back seat. However, we took plenty of time to get out from behind the cameras and take in the views from the cockpit. What a great experience. 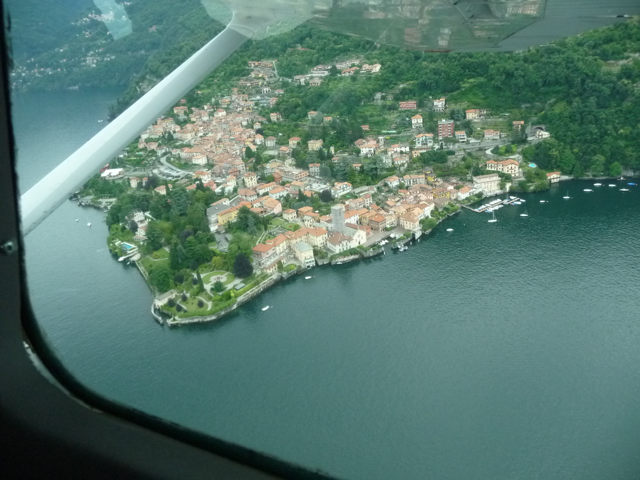 Our return flight to Bellagio took around 30 minutes and fortunately, the prevailing winds meant that we had to approach over the city of Como before lining up for a landing to the north. Seeing the city from the air was a real bonus. Our first water landing was very smooth and our smiles said it all – a fantastic flight over one of the world’s most beautiful places on a smooth and clear afternoon. “Bravo” Pietro! While were were dining at N’Joy we looked up to a mountaintop on the eastern shore of the lake directly opposite where we were dining and saw a tower/lookout. We asked the waiter the name of the place and he told us it was St Maurizo. We decided that we would pay a visit to this place if we could find our way up there. The GPS map didn’t show us the exact location however we saved a place that looked close and “asked” surfer dude to take us there. Well, what an experience. In the manually geared Ford we negotiated our way up the precarious one-way roads and avoided banging car bits with the expert local drivers that seem to be in training for the Monaco F1! We now completely understand why they drive around in tiny little cars of all makes and models – because you can’t get past anything else! I am happy to report that we found St Maurizo despite having reservations about our sanity. In reality, we couldn’t turn around anywhere so we just had to keep going. The view from the lookout at St Maurizo was spectacular. 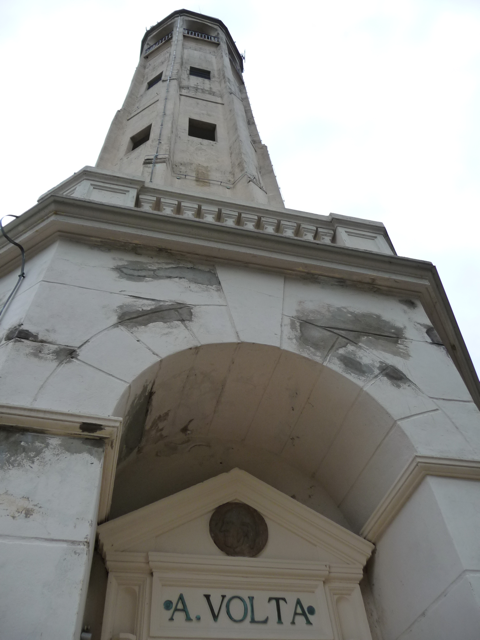 This “lighthouse” tower is named after A. Volta – the renowned Italian inventor of the battery. 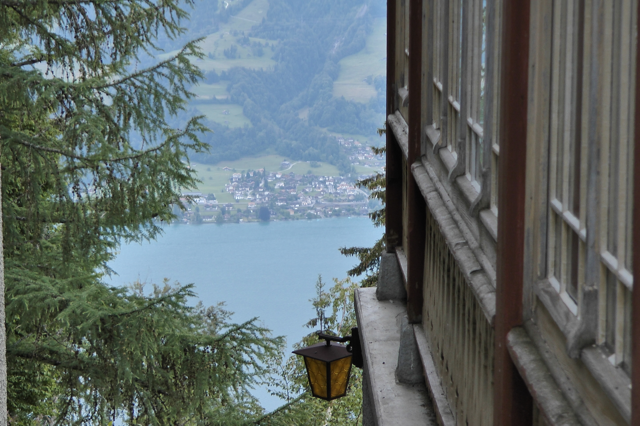 We looked down over the lake and all the way to the west and north west into Switzerland and right down to our hotel. We watched the seaplanes take off and land way below us and enjoyed the late afternoon sun rays piercing the clouds and illuminating the rolling hills that define the landscape to the south of Como. Another “wow” moment or two. The trip back down the mountain was no less exciting however, we knew what to expect this time around so we were not so surprised when we had to back up at some of the impossible U turns and let other traffic through. When we arrived back in Como we decided to pick up a bottle of wine to enjoy on our hotel balcony. We settled on a Carrefour supermarket and had fun working out the names of things to buy. Of course we couldn’t just buy some wine, so we circumnavigated the store in search of a variety of food and other items before being asked to hurry up because the store was closing! To make matters more interesting, when we arrived at the check out, we hadn’t weighed our fruit so we had to get the assistance of another customer to weigh and mark our groceries. The store manager was not happy with us – his look said it all! The Princess did her best to cheer him up but his face seemed incapable of smiling. We are now settled on our balcony in our room. It has just gone 10.00pm and the church bells reminded us with their beautiful sounding chimes. We have reviewed some of the photos that we took today and laughed at some of the experiences we had on this fantastic third day in Italy. What a Plan B it turned out to be. 24 hours to go before we return to the air and start winging our way to Milan for the beginning of our Euro’venture – 2011. The bags are packed and the cameras are ready. 3 weeks of traveling through Italy, Austria, Switzerland and Germany. Europe – what a fantastic place to spend 3 weeks! Take a look at where we are staying by clicking on the following link.